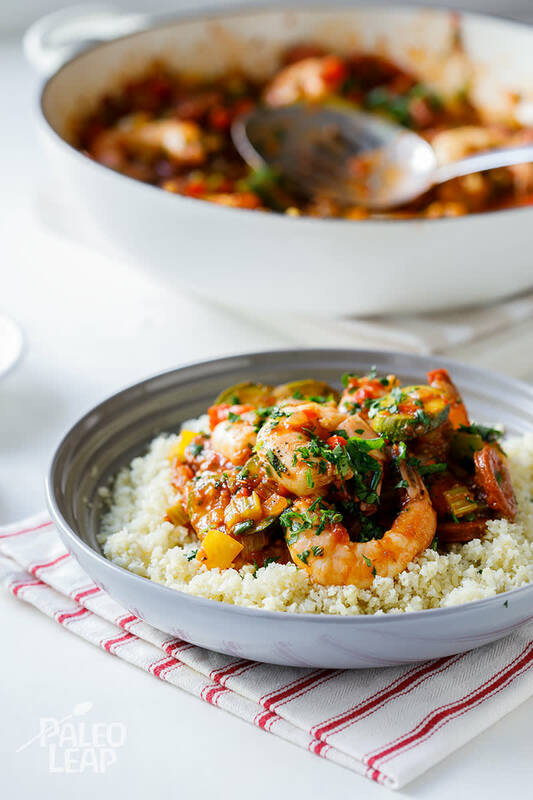 Creole jambalaya is a delicious, steaming one-pot meal of tomatoes, smoked sausage and rice, with three must-have vegetables: onion, celery and bell pepper. In the beginning there may have been some saffron influence in there too, as it resembles a Spanish paella, but as saffron was not available at that time (in that part of the world), it is thought that red tomatoes were added instead for color and it became a city-French type of dish. While the history is a bit fuzzy, it is true that no matter how many times you eat it, there is a pretty good chance that it will taste different with every batch, because the variations of meat and seafood options are endless. And here we are changing history, since we are cutting down, even eliminating, rice in our diet. To Paleo-ize this dish we are adding cauliflower rice as a healthy alternative to the traditional white rice, without losing on flavor. We have the jalapeño, cajun spices (garlic powder, paprika, onion powder, cayenne pepper, oregano, black pepper, red pepper flakes) and thyme for that. Plus the chorizo adds a bit of kick as well, depending on how spicy it is to start with. Nick a bite from the pan as it is frying, it will let you know how much more heat to add. Being neither a soup, nor a stew, this dish is open to any green side dish or fresh lemonade to quench your thirst. And it is a wonderful meal to share with multiple friends around your lively table. Melt the coconut oil in a large frying pan, add the chorizo and fry until golden brown. Remove the chorizo from the pan, leaving behind the golden oil. Add the onion, celery and peppers. Allow to cook for 5 minutes until they begin to soften. Add the garlic, zucchini and jalapeno, and cook for another 5 minutes. Add the chorizo back into the pan. Add the tomatoes and shrimp and cook for 5-10 minutes until the shrimp are cooked through and the sauce has thickened slightly. Season to taste, then top with fresh chives and parsley. Serve over cauliflower rice.